The foliage in the 4.15 don't have dithered LODs in my end, and at check it in the materials don't work ? *Fixed! Note you have to set all the affected materials by the same model to dithered or won't work. Last edited by Hevedy; 01-30-2017, 10:56 AM. How about actually fixing the context menu bug which will probably remain in the next big Windows 10 update? it will break for everyone that's for sure and Microsoft still didn't do anything about it (I tried the latest build from a few days ago, same thing). I'm sure you don't want thousands of posts about UE4 Menus broken. Edit: It says the last version this bug exists is in 4.14, is it fixed in 4.14.3? or should we wait for 4.15 final? Last edited by JacobMrox; 01-30-2017, 12:23 PM. I can't deploy to GearVR as it says I need to make sure the APK is signed, even though I have copied the osig files from 4.14. 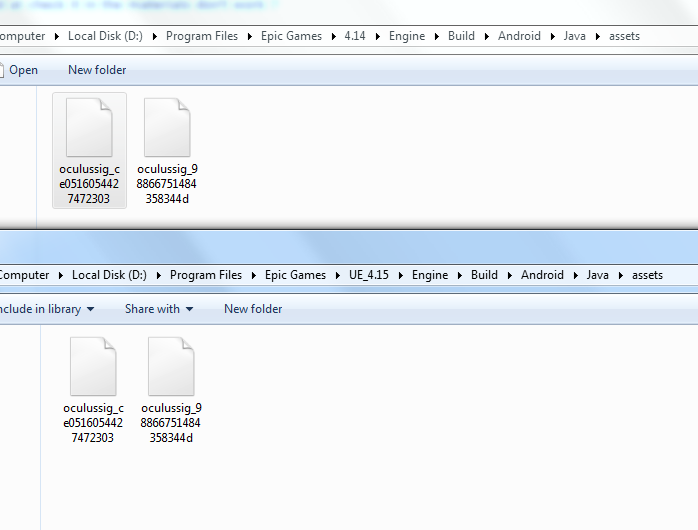 Also not sure if it's normal, but the new version's folder has a UE_ prefix. You should make a bug report on AnswerHub. Done that, but I have rushed a bit ahead with it. Restarting my PC then doing a full rebuild did the trick. Thanks anyway! Too bad that mobile multi-view is still not working (black on one side). I was big hopes for it. Enter cmd in the search box, and then right-click or press and hold Command Prompt. In the Administrator: Command Prompt window, type one of the following commands depending on your version of Windows, and then press Enter. Don't include a line break as shown here. Note: Use the troubleshooter to resolve Windows Update errors "0x80070002" or "0x80070003". This problem occurs when some files in the Windows Update are missing, even though the update is downloaded and extracted successfully. Fore more information click the link below. i tried everything else. this actually worked. We're working on implementing this for the PC when using the forward renderer. We had the mobile version working first, so we went ahead and pushed it out for this release. I believe we've finally found the root cause of the performance discrepancy and we're working on addressing it. We wont be bringing over this specific change (it was more of a stop gap while we investigated the issue), but we are working on a fix. I can't use ScrollBox without breaking my game's camera controls. Wondering this myself, seems like a pretty bizarre change to do on purpose. Or at the very least get some suggestions as to how we can get a nice glow going without just making our emissive lighting turn white/purple. Totally agree. Why this behavior ? For the record, the new glow behaviour isn't an issue for me because of how it works. What bugs me is having to re-tweak all glow values everywhere in the game, while other UE versions usually didn't break content. Yeah, that can't just be "by design" since it breaks all current content. If it is by design, then at least every material needs a checkbox where you can check if you want this new behavior where an emissive blue is getting purple and later white, but that checkbox should be disabled by default for every material that was created before 4.15. But it is an issue because of how it works, you can no longer get the look you had before. It is impossible now to get any saturated color that's causing a lot of bloom. For that it has to be multiplied by ~20, but once you do that with any color its just something like white. So you can't have a strong glowing blue or red material now, they will no longer be blue or red. So the issue is not only that you would have to redo all your materials, but also that its impossible to get the look you got before.